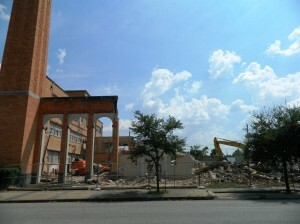 Demolition is progressing at Rutland and 20th St in the Heights. Part of the old Baptist Temple church had been sold back in May. The proceeds from the sale will go to a $3M renovation of the remaining structure. An extensive Baptist Temple press release gives details of the renovation and the thought behind it. 09/14 Update: I was hoping the old tower would saty (shown in photo), but I went by yesterday and it was gone. Just the old boxy-looking building remains. It seems like a win-win for everyone. The existing historic structure needs extensive updating. The land surrounding it had appreciated in value. It made for a good swap. The new owner of the land is Braun Enterprises. The same father-son group that is re-developing the old Harolds in the Heights building. They also own the funky Yale Pharmacy with its old soda fountain. See my post on Torchy’s Tacos going into the old Harold’s building. The developer seem to have a historic esthetic though, so hopefully the new retail will blend into the Heights. Renovations will impact nearly all of the 65,000 square feet of worship, classroom, and office space in the T.C. Jester building. Plans call for a new 300-seat sanctuary, a new entrance and foyer, new learning and play areas for infants and children, and numerous modifications that will bring the entire building up to Americans With Disabilities (ADA) standards and other city codes. The sale to Braun Enterprises includes two buildings: the original church sanctuary built in 1912, and a larger 1,300-seat sanctuary built in the late 1940s. Both buildings, located on the northwest corner of Rutland and 20th Streets, will be demolished to make room for retail space planned by Braun, the same father-and-son firm that purchased Harold’s in the Heights clothing store last year and has owned the Yale Pharmacy since 2007.